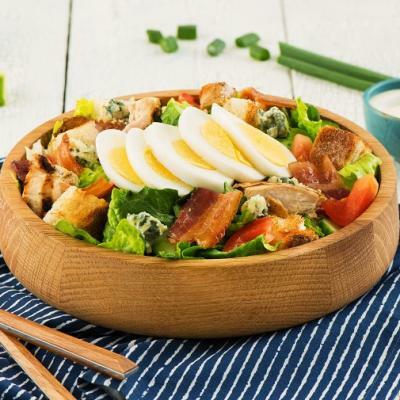 This salad is a fun take on a fan favourite. 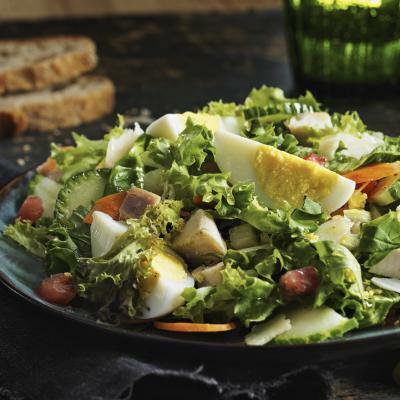 Add eggs to make this lunch salad both delicious and protein rich. Did you know? Free run eggs come from hens that roam the entire barn floor. Some barns may be equipped with multi-tiered aviaries. Place bread cubes in a medium bowl. In a small saucepan over medium heat, melt butter and allow to brown slightly. Pour over bread cubes and toss until evenly coated. Spread bread cubes in a single layer on a parchment lined baking sheet. Bake, stirring a few times, until crisp and golden, about 40 minutes. Toss with chopped parsley. Let cool and set aside. Place prosciutto in a single layer on a parchment lined baking sheet. Cover with a second piece of parchment paper and a second baking sheet. Bake prosciutto until evenly browned and crisp, about 15 minutes. Let cool, and set aside. Meanwhile, cook eggs to soft boiled stage, cool. When ready to serve, peel and slice eggs in half and season with salt and pepper. (To assemble) In a large mixing bowl, add torn romaine hearts, croutons and about 1/4 cup of vinaigrette, toss gently to coat lettuce evenly. Divide over 4 serving dishes. 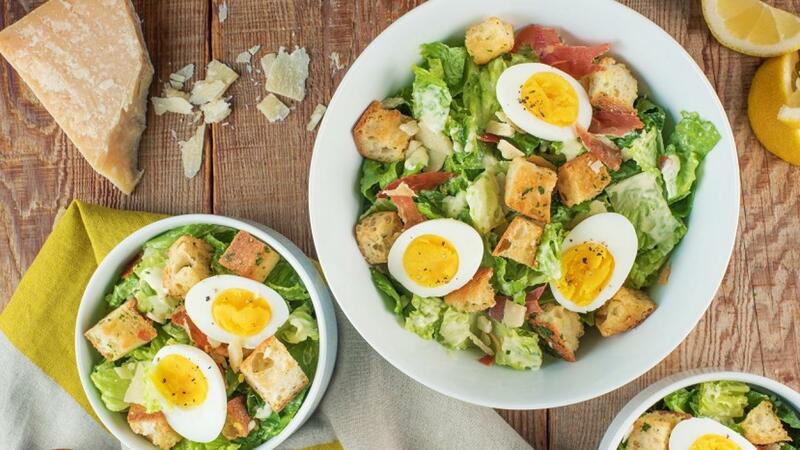 Top with boiled egg, crispy prosciutto slices, additional grated Parmesan cheese and a lemon wedge. 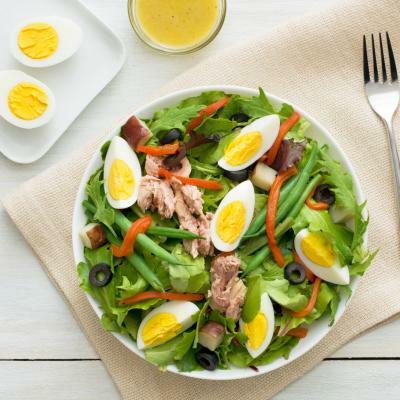 Serve with additional vinaigrette on the side as needed. To finish add lemon wedges, additional grated Parmesan cheese and cracked black pepper. Slowly whisk in oil until emulsified. Whisk in lemon juice and garlic until thickened to desired consistency. Whisk in anchovies and Parmesan.